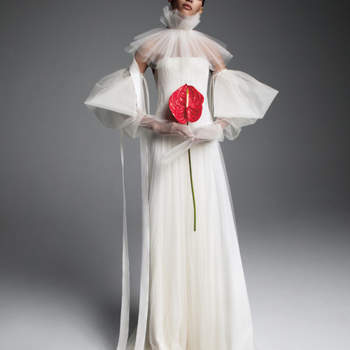 Having debuted to rave reviews at the long awaited New York Bridal Fashion Week in early October, the new collection from Vera Wang for Fall-Winter 2019 is guaranteed to absolutely wow you. Aptly named the Versailles Collection – immediately reflecting the lavish, decadent and rich fabrics and patterns of these dresses – the undisputed Queen of Bridal Fashion Vera Wang goes all out in an attempt to impress us (and succeeds!). 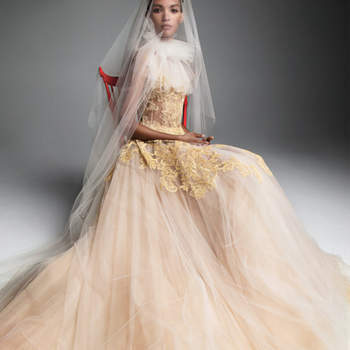 With each of these gowns named for an infamous woman in the history of European royalty, we can absolutely guarantee that any bride lucky enough to secure one of these couture dresses for her wedding will look breathtaking. Of course, if you’re aiming for lowkey on your wedding day, it might be a better idea to look to designers such as Temperley Bridal and Halfpenny London for your outfit, but if you want a gown that will have every pair of eyes on you, then Versailles was made for you. Look like you’ve just stepped off the catwalk in one of these ethereal gowns, and make a real statement! For an evocative masterpiece of a wedding dress, then we can truly recommend no one more highly than the indomitable Vera Wang – enjoy the gallery! Maria Therese. Credits: Vera Wang. Maria Jose. Credits: Vera Wang. Anna A. Credits: Vera Wang. Maria M. Credits: Vera Wang.